Not print black colour, and not print word doc. Hi my ip4500 does not want to print on my printable cd, what can be the problem? hello, when i try to print, i get a message saying that the paper out tray is closed - when it is fully open so can not print. Any ideas please? The power light (green) and alarm light (orange) keep flashing alternatively. Can anyone help please. Solution 1: I had 12 orange light flashes on a Canon IP4500 and could figure out why. I thought I was doomed. I searched other sites which gave me the solution. Found the little ink wipers under where the inkhead is normally parked. At first I did a weak cleaning attempt, but that didn't work. Then I cleaned them really good with q-tips and windex. I used a lot of q-tips, and it wasn't easy to reach. I cleaned all around the little wipers too and tried to get up as much dried ink as possible where ever I could see and reach . It actually became pretty clean. I then tried powering on again and wal-la it worked. Hope this helps. 1 out of 3 people found this solution helpful. Solution 1: Have had similar problem post a power cut. Disconnect mains cable from printer for about 5-10 minutes, then reconnect and try to switch machine on. Product was returned for repair and they were unable to reproduce fault. 0 out of 4 people found this solution helpful. Problem: Not print black colour, and not print word doc. 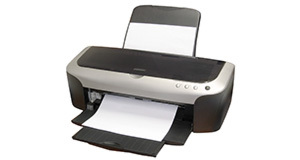 Solution 1: Problem: Your printer will not print using the pigment cartridge. dry cartridges for a long time. more ink coming off the head. Place the head assembly on a wad of clean kitchen roll and then the fun begins. the other colours, do the same. Reassemble, and run the cleaning sequences (this may take a couple of deep cleans), and then do a pattern check. Hopefully, you're good to go! If this fails, you need to do a bit more cleaning. hand side of the printer, and the linear encoder strip at the back of the head assembly. carraige normally parks. Warm water is your friend. filthy. Carefully hold it up with a finger and clean once again with a alcohol-soaked cotton bud. Reassemble, and and go through the normal head-cleaning routines. All problems on this page have been submitted and answered by users. If you have a problem with the Canon PIXMA IP4500, please submit it below and we'll post it here. Problem: Hi my ip4500 does not want to print on my printable cd, what can be the problem? Problem: hello, when i try to print, i get a message saying that the paper out tray is closed - when it is fully open so can not print. Any ideas please? Problem: The power light (green) and alarm light (orange) keep flashing alternatively. Can anyone help please.